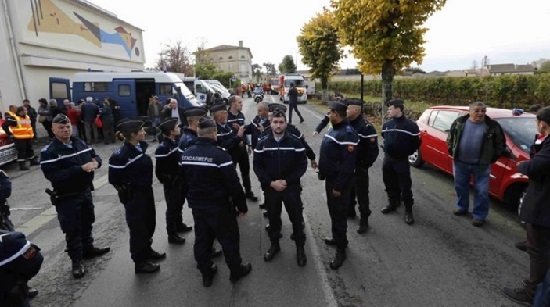 At least 42 people have been killed in a collision between a bus and truck near the southwestern town of Libourne. The bus caught fire in the Friday morning crash that also left the driver of the truck dead. Images shown on French television showed the coach as a charred shell that had been entirely burned. Five surviving passengers were brought to hospital with injuries while three others were unharmed, local authorities said. The interior ministry said the bus was carrying elderly from a nearby village going on excursion. The French president said he had been "plunged into sadness by the tragedy". This is the worst French road disaster since 1982, when 52 people died. Prime Minister Manuel Valls has also arrived at the scene.